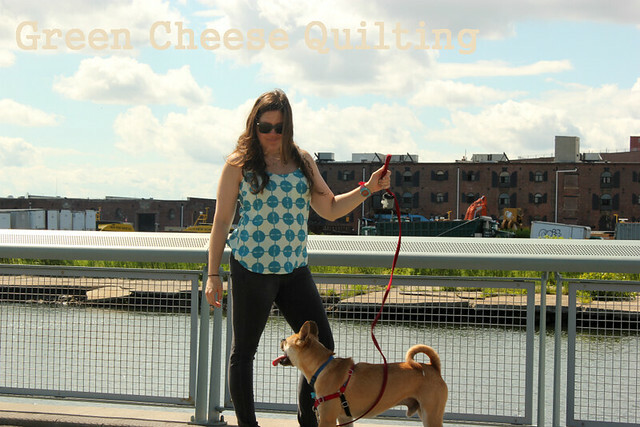 Me in my first ever personally sewn garment, and Picasso, my doggie. Hello! 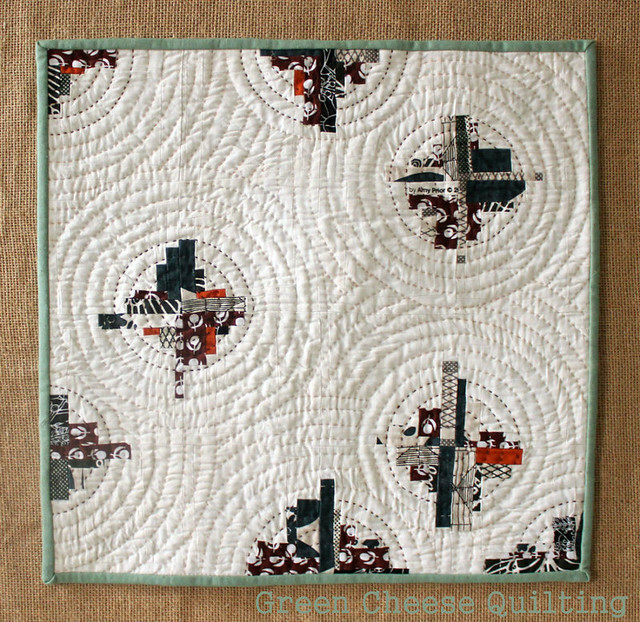 Today's my day on the New Quilt Blogger Blog Hop generously hosted by Plum and June! If you're new glad to have you, and if you've been here before thanks for returning! 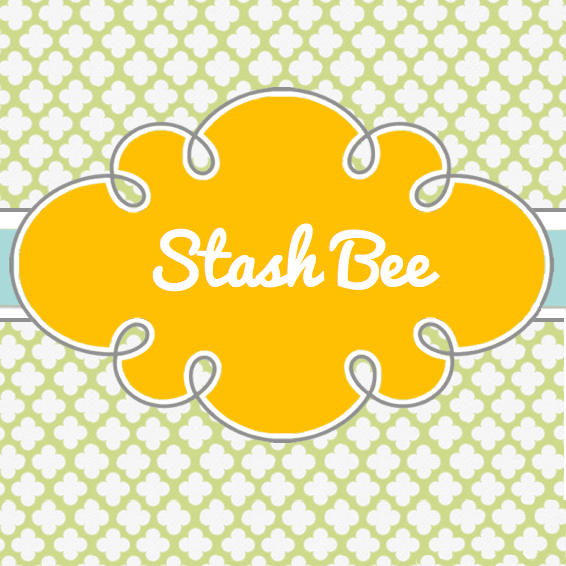 I'm a new quilter (about two years under my belt), an even newer blogger (just a few months!) 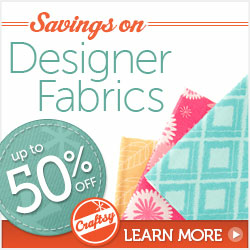 I tend to like modern fabric palates and both modern and traditional quilting patterns. I'm especially drawn to graphic designs. Liberty Trip Quilt - most recent quilt finish! I've done both hand and machine quilting. Both have their perks, but I'm better at hand quilting. Less puckers! I just don't have the patience for it. I'd love to learn how to free motion quilt, eventually! 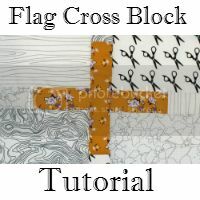 A great quilting tip I can't emphasize enough is test out any method of marking lines! I keep making lines for quilting (both machine and by hand) with materials that don't readily wash out (who knew chalk wouldn't come out easily??!!) No one wants to ruin their beautiful work with some stray lines! Broken Umbrella Mini Quilt - 24"square, hand quilted. 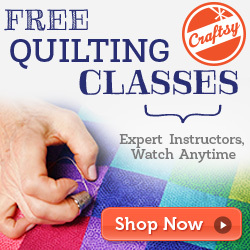 I'm motivated by online quilting competitions and link-ups. Without them I may never finish anything! I also really enjoy making my own patterns for quilts, paper piecing patterns, and other small bags/pouches. A great blogging tip is to be yourself. I know, I know, broken record! But, you want to make sure that you're enjoying the process of blogging, and not feeling like it's work or an assignment. Along these lines, stop apologizing! I see so many posts by bloggers I follow or click on from linkys apologizing for not blogging, for bad pictures, for mismatched seams, etc. You should only be accountable to yourself, you don't need to apologize if other things get in the way of sharing your work! Another tip that may be more practical is to host your images online (Flickr, Photobucket, etc). You can share or embed the html into your blog, and then you don't use up all your space on pictures. I had an old blog I kept of my travels and I stopped writing in it when I filled up all the space with pictures because I didn't want to upgrade the blog and purchase more space! Now I don't really worry about that because I host all my pictures on Flickr. Glasses cases (front and back), my own pattern. I'm pursuing my PhD in Environmental Science, and am really passionate about education. I also waitress. I live in a one bedroom apartment with two cats and a dog and a boyfriend. Ice cream is so amazing I rarely pass up an opportunity to eat it. I don't like artificial banana flavor. I'm the alpha dog in the apartment. So, what's your opinion on photo hosting? Are you Team Flickr or Team Instagram? Hi, Liz! I *love* all the quilts you have pictured - kudos on hand quilting at all because I have no patience OR skill with that : P As a very newbie to IG, but not a true Flickr devotee, I guess I'd have to side with the latter just because it's so quick and allows me to share a little more than quilts. Also, ice cream rocks, and fake banana is absolutely gross. My husband loves Chunky Monkey and I find it appalling! I wasn't sure why somehow had the pictures on Flickr but that makes sense. I love the quilts you have shown. Beautiful work! I like Flickr to host the 'proper' photos that I post on my blog and I like instagram for those quick action type shots to post what I'm working on while I'm working on it. Most of my WIP shots end up on instagram because it's so quick and easy. I laughed how you counted the boyfriend last in the list of apartment inhabitants! Ice cream is the best. I bought an ice cream maker so I can make my own but I don't use it enough. Sometimes it's just nicer to have something someone else made (and made better!). I have learned the hard way about marking lines too! I am much more careful now, but I still get it wrong sometimes. Hi Liz! Nice to meet you, I also love hand quilting. I really like your umbrella prints mini quilt and the glasses cases, so cute! I don't use Flickr or Instagram much, I still do everything on blogger--I hadn't even realized you could run out of space. I do have a few photos on Flickr, but maybe I should be posting more. Thanks for the tip! That is a very good point about waitressing! It's made it much easier for me to take vacations...although they still like to guilt trip me! Nice to meet you!! What is your specialization with your environmental science studies? I have an undergrad in environmental science and a masters in elementary education, so it sounds like we have similar interests! I worked as a wetland scientist for 6 years before teaching for a couple of years and then becoming a full time mommy. What fun! These days I use instagram more than flickr, mostly because of how easy it is to snap a photograph with my phone and post it up to instagram. Now that I'm focusing on using my actual Canon camera more than my iphone, I may move more toward flickr. Only time will tell. Lovely to meet you and I love your featured projects! The hand quilting on your broken umbrella wall hanging is fantastic! I love instagram because it is so simple and the app is so easy to use. I just never remember flickr. I love your projects! So beautiful! Enjoy the hop! Hi Liz! I really love your writing style and your blogging advice. :) I am not really team Flickr or Instagram. I think I would probably lean toward Instagram, but I don't have an iPhone and my wifi at home doesn't seem to work well with my iPad. Lots of excuses, I know! So glad to have met you along the hop and look forward to seeing more of your work. I love your hand quilted mini. I enjoy both hand and machine quilting, but mostly quilt by machine. 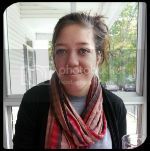 I re-size my pictures so they don't count as memory and just store them in picasa web albums. Works for me! Hi Liz, I want to be team Flickr and even set up an account and don't know how to use it! LOL I just need to take time to learn how to put my pics there instead of my blog and I will - someday. Love your work, especially your Liberty Trip quilt! Haha, well at least you've tried! It's got a small learning curve, but I'm confident you'll master it in no time! Hi Liz! I'm have an account on Flickr and Instagram, but I prefer Instagram. It might have something to do with the face that I'm still struggling to figure out how Flickr actually works. Oh, well...life moves on. I really love your full-size star quilt. It's gorgeous! It was so nice to get to know you a little better! I do both Flickr and IG and like both for very different reasons. IG is fun for snippets kind of like texting and Flickr is handy for storying kind of like a photo album! Love the Liberty trip! 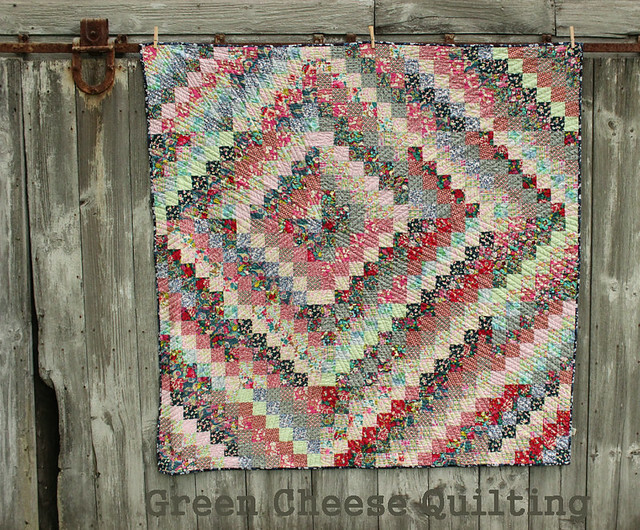 Love your Liberty Trip quilt, and great meeting you on the blog hop! I do both Flickr and Instagram, normally having my IG photos post to Flickr. I like the ease of IG, but when I'm doing several photos of the same thing, then I like Flickr better. Love your quilts, the Liberty quilt is simply awesome!!! I don't use either Instagram or Flickr. I do have a Flickr account, just I'm not used to it. I didn't know there was a limit to Blogger. The Liberty quilt is gorgeous. I've been trying to figure out how you made it. The colors don't repeat in each quadrant. I love your aesthetic, your broken umbrella mini is just gorgeous! 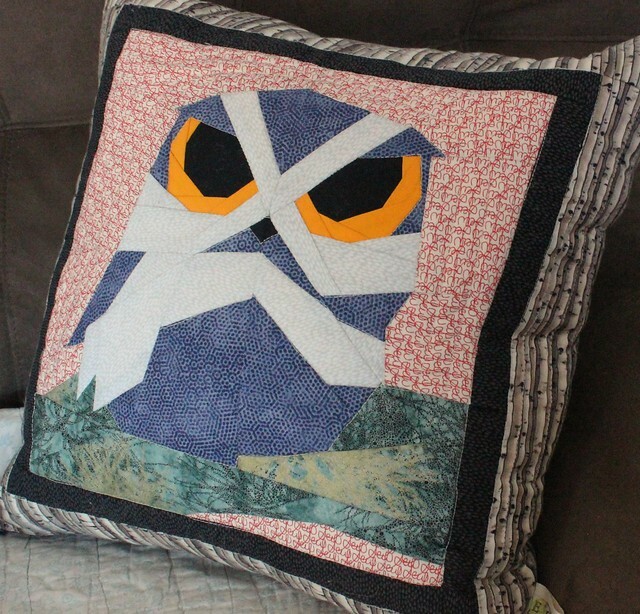 I don't know how you find space to quilt in an apartment, but well done! Nice to 'meet' you :). Hey, Liz, great to get to know you a little better :) I am still in love with your Liberty Trip quilt! I have a Flikr account but have not used it. . . I know I need to do something but have not taken the time to figure out the picture hosting... I should probably do that sometime soon. Lovely quilts, and your hand quilting is amazing. I'm not a Flickr or an Instagram user at the moment, I know I probably should try, but it's just a lack of time and blogging/following other blogs seems to keep me on the computer plenty enough without adding extra dimenions! I love your broken umbrella quilt! I haven't done any hand quilting in a couple of years because I'm way too slow at it. Machine quilting means I actually finish stuff! Visiting from the New Quilt Bloggers Hop, thanks for sharing your quilts! Ice cream rules! I joined Flickr for the Radiant Orchid challenge, and I joined Instagram for the #minimedallionqal so I guess I only join these things when I'm required to. Instagram is proving interesting, but I'm still finding my way with it. 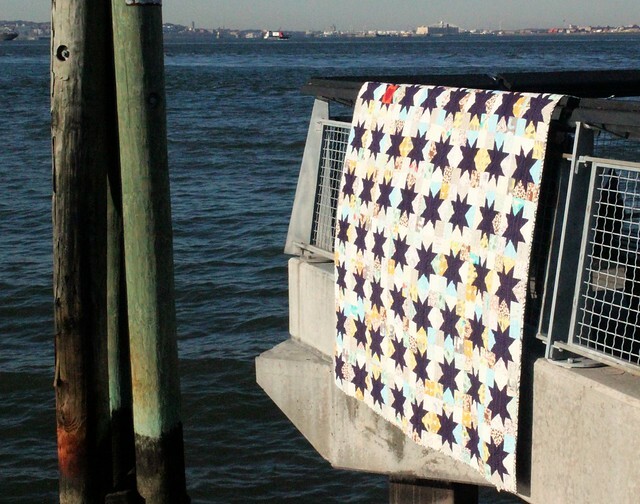 I still worry when I see your first quilt hanging over the pier. I hope someone is holding it firmly. Wow! I love your projects! Especially the glasses cases, but your quilting on all your quilts is stunning. I'm both team flickr and instagram. I feel similarly about ice cream. And I have a masters in Environmental Studies that I'm not using. Good luck with the PhD - go out and do wonderful things! Hi Liz, I joined Flickr and just started Instagram. Beside of quilting, I'm learning to sew clothes, too. I love your first sewn top and the quilts. Nice to meet you. Cute glasses cases! And the quilting on that mini is amazing! Call me stupid (ok many have) but I cannot figure out Flickr. I find it hard to navigate. And admittedly I haven't spent the time to figure it out. I really like Instagram though. Hi Liz - It's great to meet a fellow New Yorker in the hop. I live about two hours from you, and Manhattan is right in the middle. I'm from the Hudson Valley, about an hour north of Manhattan by train. I absolutely love your broken umbrella quilt. It's so cool. The name reminds me of all the times the wind blew my umbrella inside out. I love to hand quilt too. I've gotten pretty good at machine quilting which is fun. I'm just learning how to use Instagram, and am moving away from Flickr. Nice to meet you. Your blog is such total eye candy! 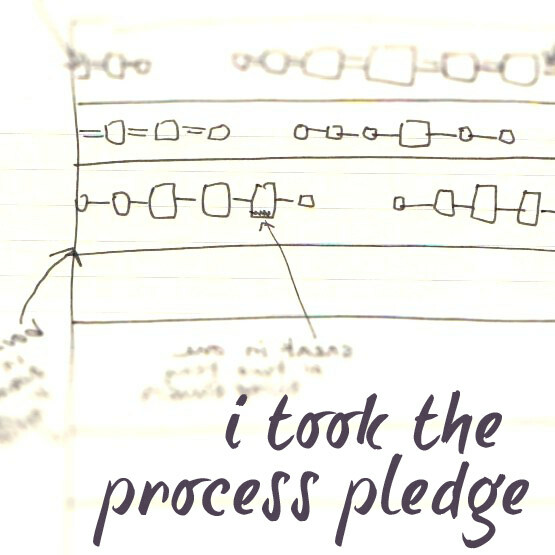 Your projects are great, your photos are great, and your writing totally rocks! I followed you here from the New Blogger Hop (I hopped last year - great opportunity!) and am really glad I did. Your handquilting is beautiful - I hope you continue to do more. I also really like your eyeglass case (any chance you'll make that pattern available?) and Otis - Otis rocks!! There has been a juvenile Great Horned Owl and his/her mama hanging out in the trees outside my office the last few weeks and I am smitten with them - Otis reminds me of the young owl, who is always staring at me as if to say "Lady, you again? Why do you keep coming out here to look at me?". Great blog, great intro! Totally enjoyed this. Great intro post for the hop! I'm rather new to both flickr and instagram but I'm leaning more toward instagram. I've never really thought about using space on my blog from uploading photos. Definitely something to consider. Thanks!